Late last night, as I was cleaning my teeth, I noticed a tiny creature dancing on the dark red towel that was hanging above the radiator. I put my glasses on and leaned in for a closer look. The insect looked rather like a splinter of golden wood as it flew a few inches, stopped, flew up again. It appeared to be such a simple, inoffensive animal, but appearances can lie. This was a clothes moth, and he was unlikely to be on his own. Clothes moths come in a variety of species. In this kind, only the male can fly for any distance. He emerges from a chrysalis and immediately starts to hunt for a female. The way that he does this is by scent – the female produces a pheromone, and he is drawn inexorably towards it. The females seem reluctant to fly : they wait for a male to turn up. Once they’ve mated, the female lays her eggs in a place where there will be lots of food. The larvae have expensive tastes. They like wool, particularly cashmere or the fine material of an expensive suit. They seem to be attracted to spots on the fabric where there are traces of the organic – sweat or urine or dropped food. The babies munch away and voila, where you used to have your favourite jacket, you now have a doily. They are also very partial to wool carpets and rugs. We had a particularly bad infestation when we lived in Islington, which could be traced back to some left-over scraps of Axminster that were left in the little attic at the top of the house. From there, the golden army had spread throughout the rest of the house. The little moth on my towel continues to hop from one spot to another. When we realised that we had an infestation, we were advised to buy some pheromone traps, to see the size of the problem. These exuded the smell of female clothes moth. On the first day, over a hundred males were caught on the sticky surface of the trap. Some still waved an antenna or a leg. What could I do? I squashed those who still seemed to be alive, to end their suffering, but I felt uncomfortable, unkind. The next step was to blast the house with chemicals, which I was deeply reluctant to do but did anyway, because there seemed to be no alternative. When animals ‘invade’ our houses, we often have a sense of disgust, almost panic. Creatures that are supposed to be ‘out there’ are ‘in here’ with us. But they are not just in the house because they like our company, or have anything against us personally, though it might feel like that on a visceral level. They are here because we have, albeit inadvertently, set up conditions for them to thrive, provided them with an opportunity. The way that we live has opened the door for them, whether it’s the flour beetles in the badly-stored flour, the mice munching on our dropped biscuit crumbs, or the moths in our wardrobes. 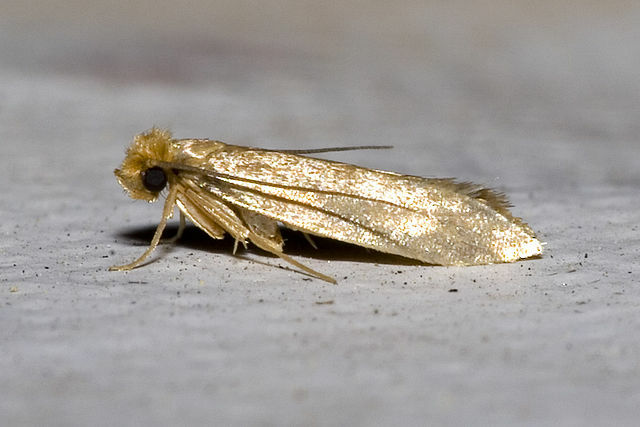 Clothes moths thrive where clothing is stored, not where it is worn. It takes time to generate a sizable infestation. This implies that there are clothes which are rarely, if ever, used, areas where nobody ever goes. A beautiful jacket that is no longer worn will become a haven for moth larvae, because it is never cleaned, never inspected, never enjoyed. It just hangs there, being eaten. 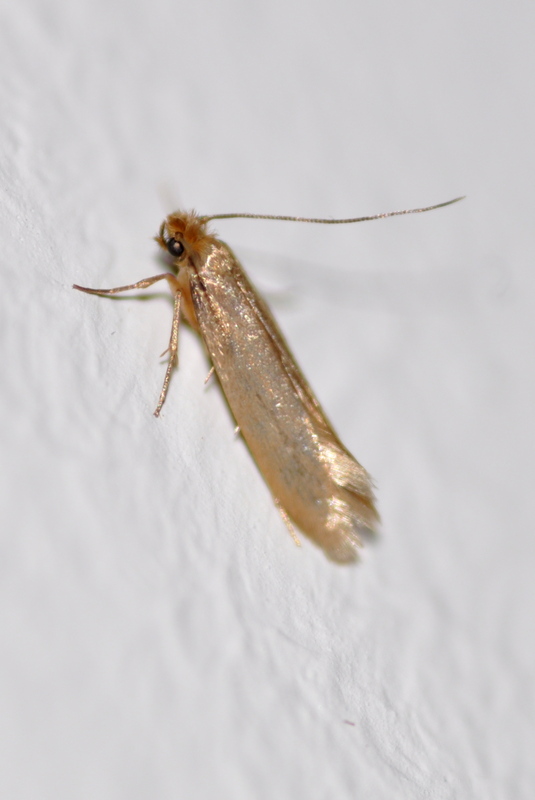 There are lots of theories about why clothes moths have made such a comeback recently. The winters are milder, houses are heated and are less draughty. But when I see moths in my home, I feel that they are bringing a different message. The moths are telling me that I have too much stuff, that I am holding onto clothes that are neither in regular use, nor packed away securely to await their appropriate season. They are telling me that I am clinging onto things that I no longer need, and which might be useful to other people. They tell me what I already know – I am needlessly complicating my life. I need to simplify. The little moth flies off. He is the only one that I’ve seen so far, but I know what I must do. Tomorrow, I will clear through the wardrobe, make sure my craft supplies are put away properly, do the laundry, send things for dry-cleaning. I will check carefully for signs of moth-damage. I will reduce what i have to what I actually intend to wear, and will find a way to recycle or dispose of the rest. And when I look at the contents of my wardrobe, realise that I can actually see what clothes I have, I will feel much freer than I have for a long time. This entry was posted in London Invertebrates on July 5, 2014 by Bug Woman. Thank you, just the reminder I needed to simplify ! I suspect my fondness for worn Oriental carpets could be a source, will have to vacuum more often…..
what is this month called? Genus/species? It’s Tineola bisselliella, Regina – I should have included that in the post, sorry :-(.